There are few places left on earth so remote and untouched by time. Socotra is one of the world’s last truly wild places with a uniquely diverse and enchanting landscape of surreal beauty. Rich in mythical history, Herodotus wrote of the immortal phoenix that came to this island to be reborn in a nest of cinnabar and incense every 1,000 years. Frankincense that burned in the temples of ancient Greece and Egypt was harvested from this island. Glimpsing the dragon’s blood trees that mantle the Haghier Mountains, one imagines this is what the world must have looked like millions of years ago. Most astonishing are the trees! 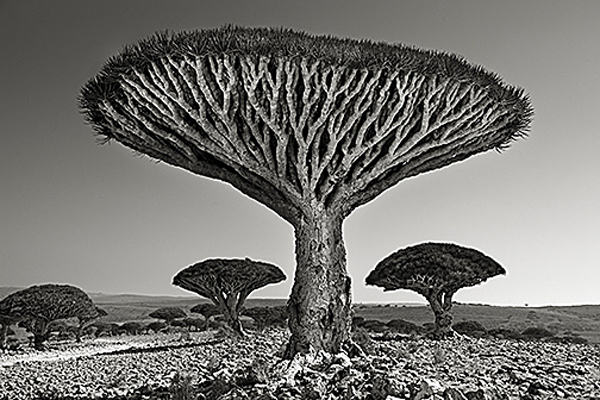 Living up to 500 years, the mythical dragon’s blood tree with vertical trunk and arching canopy could easily be imagined as an umbrella blown inside out. When the trunk is cut, a scarlet colored resin oozes from the tree prized for its celebrated medicinal qualities. Sap from the tree was sought by Roman Gladiators to cure wounds. Once a vast forest, these remaining trees, unique to Socotra are now classified as endangered. Recent years have shown a troubling decline due to over grazing and insufficient cloud cover needed for young saplings. I believe it is through the unique vegetation that the spirit of Socotra is defined, with mythical trees like the dragon’s blood tree or the fabled frankincense trees and the island’s culture so closely linked to nature which sets this island apart from the rest of the world.